Story Contracting have acquired the rail plant division of Scotland-based Caledonian Industrial in a deal which expands Story’s national footprint. Allowing the business to support the needs of clients more efficiently. Caledonian’s rail plant division, based in Edinburgh, provides track maintenance services across Scotland to Babcock, a key contractor to customers including Network Rail, Transport Scotland and First ScotRail. 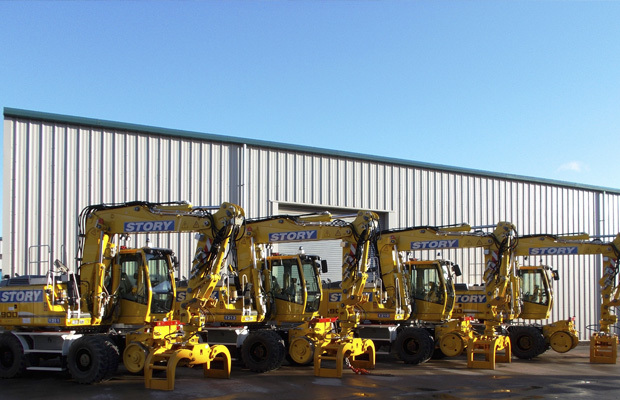 The addition of the Edinburgh base doubles the size of our in-house plant fleet at Story to more than 50 vehicles. Story’s Plant Division will invest significantly in state of the art machinery as part of a commitment to safety and a response to the ongoing concerns of plant reliability across the industry. Story Contracting plan to relocate the Edinburgh site to larger and more modern facilities in the region within the next 12 months. As part of the acquisition, 17 staff from Caledonian’s Rail Division will transfer to Story Contracting under Transfer of Undertakings (Protection of Employment) (TUPE) regulations. The division will immediately trade under the Story brand. “This is a transformational deal for Story and underlines the ambition and growth of our Plant and Rail divisions, which provide integrated services to our customers. With a base in Edinburgh, alongside Carlisle and Normanton in Yorkshire, we now have the capability to provide efficient support to sites across the country. “The deal also means that the size of our fleet doubles overnight, so the range of machinery and vehicles on offer to our customers is among the best in class. However, we are not complacent. We have committed to a programme of investment in the fleet and we recognise the need to expand and modernise the Edinburgh base. We have invested significantly in our Rail and Plant divisions in recent years, creating a leading fleet of machinery and this latest acquisition sees us continue to invest in both our people and our business.